... contains a noteworthy collection of baroque extravaganzas such as figuratively designed fireplaces and wooden ceiling ornaments. 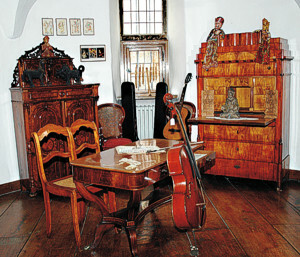 Musical instruments from the 16th to 20th century, however, occupy a major portion of the museum's exhibit - a collection of the Bochum musician Hans Grumbt. The "Ehrich East Asian art collection" was likewise privately collected and donated to the city of Bochum. Not far from the moated castle Kemnade, the farmhouse museum is housed in a saddled-roofed half-timbered house. Built around 1800, it formerly served as a dairy farm. In order to preserve it from dilapidation, it was deconstructed in the early seventies at its former location and rebuilt at its present location. The farmhouse museum documents rural culture through numerous exhibits. Farm equipment can be seen here, as well as 16th and 18th century furniture from Westphalia and the Bergisch Land. A nursery and spinning room, among others, are in the upper story. Next to the farmhouse museum, there is a cottage and herb garden.